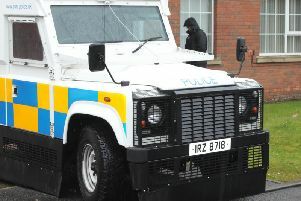 Police are hunting for two dark-haired men after an attempted burglary in Lurgan. One of the men dressed in red hoody was armed with a crow bar. The pair were disturbed by neighbour while trying to force entry to an elderly residents home in Shaerf Drive yesterday at 1.15pm and made off. A PSNI spokesperson said: “This shocking incident could have been an even more terrifying ordeal for the victims had it not been for an alert neighbour. If you know who these males were, or saw anyone matching the description in the area at the time and know who they are, please call us immediately on 101. The incident number is 636 of 26/2/2018.